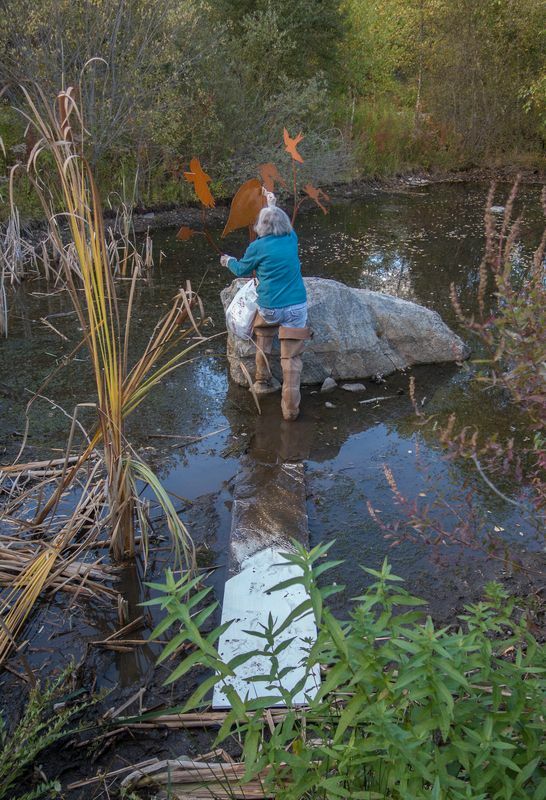 Yesterday was a beautiful fall day; perfect for a touch-up on Heron’s Dream. 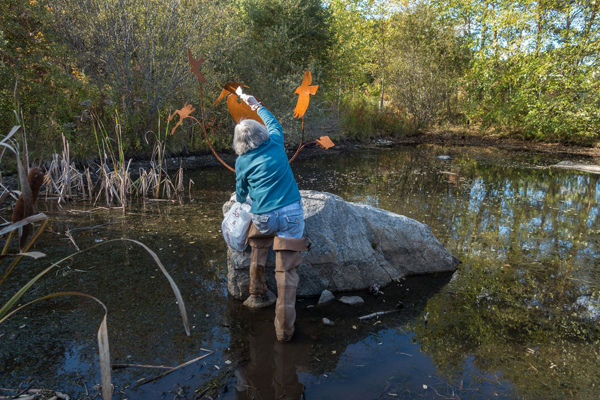 This kinetic sculpture, a collaboration between The Acton-Boxborough Cultural Council, the town of Acton’s NARA Park, Carolyn Wirth, and myself, was installed after the pond froze last winter. The grant process, town approvals and contract negotiations meant that I could not fabricate the sculpture earlier. But no worries, we got it in before Christmas. Now, nearly a year later, it was time to check on the silicone grease at the joints and give the natural “patina” of the steel a coat of Penetrol, a rust inhibitor that also makes the rusting surface look clean and warm. One of NARA Park’s crayfish guarding Heron’s Dream. This is a denizen of the pond who thought he could intimidate my companion/helper, Egils. Ferocious, isn’t he? Note the little seeds stuck delicately to the crayfish’s claws (click to enlarge). 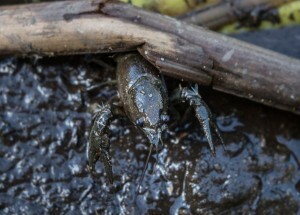 We don’t usually see many crayfish. The mud slid right off his body, unlike the way it stuck in squishy globs to everything else. I wondered if the depth of the water would be an issue, since I am not very tall (understatement) and I wasn’t sure how deep the sediment below would be. But this was a very dry summer and autumn, so October proved to be the ideal time. The tiny pond was surprisingly shallow, so this would be easy. Except for the muck, that is. I relied on my son Eric’s fishing waders, and a pole for balance. The closest, shallowest approach was eighteen feet from shore to stone. Two pieces of plywood I brought served as a pathway to stand on. One of them doesn’t show in the picture because it’s submerged in the ooze. The main issue was the mud-viscosity-to-boot-surface ratio. When I stepped directly in, the mud didn’t want to give my boot back. Also the waders are clumsy to walk in, since they’re heavy and too big. But they do give a sort of swash-buckling flavor to my ensemble, don’t you think? Avoidance of falling into that nice organic muck was the main motivation for the plywood. It worked well. So, I cleaned off and reapplied silicone grease to the kinetic parts, brushed on the Penetrol, then made my dashing (Ha, ha. More like “slow and careful.”) exit. This entry was posted in Art, life in general, process, sculpture and tagged commissions, contemporary art, environmental art, kinetic, public sculpture, sculpture. Bookmark the permalink. Post a comment or leave a trackback: Trackback URL. Hi Joyce, Keeping your sculpture pristine does take ingenuity! Well done! It looks wonderful. Hello Maureen. Thanks from me and from Egils, too. One thing I did not expect about the procedure was the crayfish. I don’t often see them and there they were, observing. Florida…maybe sometime we will take you up on it. A few years ago one of my sculptures was in Winterhaven as part of an exhibit organized by the Polk Museum of Art. There are some fascinating outdoor sculpture shows in Florida from time to time.